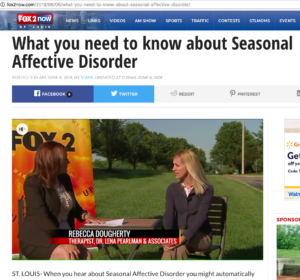 Rebecca Dougherty, LCSW on Fox 2 News About Summertime Sadness! “Summertime Sadness” was a hit song by singer Lana Del Rey a few years ago. It is also a real medical condition that impacts two million people in the US. Most people are aware of Seasonal Affective Disorder (SAD). This condition occurs in the winter when the weather cools off, the amount of sunlight each day reduces, and people spend more time indoors. Summertime is a trigger for those who suffer from Summertime Seasonal Affective Disorder (Summertime SAD). When summer begins, those with Summertime SAD begin to experience depressive symptoms. Summer depression often include loss of appetite, trouble sleeping, weight loss, and anxiety. Medical experts are divided on the exact causes of the disorder, but many believe that it has to do with schedule changes in the summer for students and families, body image concerns due to pool/beach attire, and potentially financial worries due to vacation spending. For more information, people can reach Dr. Lena Pearlman and Associates by phone at: 314-942-1147, by e-mail at: bryan@stlmentalhealth.com or online at: www.STLmentalhealth.com.